that I must now write to you. seems to be escaping your sight. that you don’t have to put up with all this. and it clearly reads CONDOMS. that you wouldn’t regret your destination. like pebbles caught in a wave. Do you want to give me a reply? You have given me strength I could not find. Can witness how our love has grown. 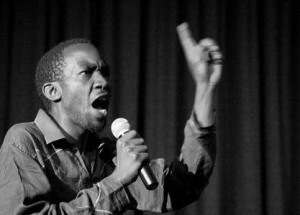 Jacob Oketch is a poet and a freelance journalist based in Nairobi, Kenya. He has been performing and writing poetry for almost a decade. At the moment,he is preparing to publish his first collection of poetry. He is also in the process of releasing a poetry CD that features other two poets from the East Africa region. Oketch is a postgraduate student in journalism at the University of Nairobi. He has worked with a number of foreign and local cultural institutions to promote and publicise poetry including Goethe institute Nairobi, Italian institute of Culture Nairobi, and Kwani Trust. He has featured as a backup vocalist in a Kenyan musician’s CD besides also previously featuring in an acapella group. In addition, he has also acted in plays staged by theatre groups in Kenya, most notably the University of Nairobi free travelling theatre. He has written articles for various magazines published in Nairobi.